Come celebrate the intellectual accomplishments of our senior capstone students at The Bullis Signature Programs Showcase! On Tuesday, April 16, students from our four signature programs, Entrepreneurship, Humanities and Global Studies, STEM, and Visual and Performing Arts will present their senior capstone projects in a full-day program. Students will share their work in a number of ways: performances, demonstrations, TED Talks, original documentaries, art shows and presentations. » View a detailed list of the projects and a schedule of the day. And don't miss this article in EdSurge, How Senior Capstone Projects Let Students Research—and Present—Their Passions written by Lisa Vardi, Bullis Executive Director of Teaching and Learning. Parents are welcome to drop in or spend the entire day at the Symposium. Check-in at the Discovery Center Lobby or Blair Lobby to receive a program and up-to-date schedule. 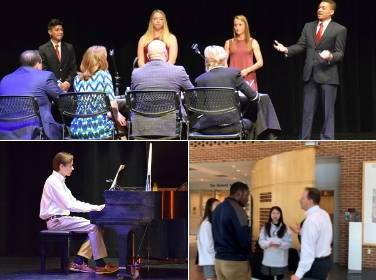 Tuesday's showcase will feature Performing Arts performances beginning at 8:15am in Blair Auditorium. Following that, students from the STEM, Visual and Performing Arts, and Humanities and Global Studies will present their work in the Blair Center and the Discovery Center. The Entrepreneurship Shark Tank is scheduled to begin at 12:50pm in Howard Auditorium, The Blair Center, and the day will conclude by 2:45pm.